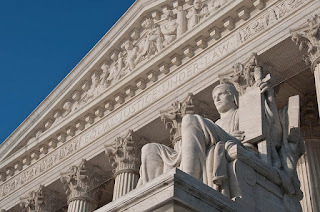 The audio and transcripts from the Supreme Court Tuesday, March 27, 2012 arguments on the challenge to the individual mandate included in the health reform legislation have been made available on the Supreme Court website. They are posted below. I have written previously on the make up of the court and the likely votes of the various Justices. Please read that post to understand the full context of my reading of the court's position at this point. After analyzing the comments today, it appears that Justice Kennedy is very skeptical of the constitutionality of the mandate. Some particular comments that may show his thinking are that he called this unprecedented for the federal government to impose an affirmative duty on people to buy a product. He told President Obama’s solicitor general, Donald Verrilli Jr. that he had a very heavy burden to show the constitution allows Congress this power. And perhaps his most telling is that out of the gate he asked "Can you create commerce in order to regulate it?" Kennedy also suggested that the way in which the law requires "the individual citizen" to act "is different from what we have in previous cases and that changes the relationship of the Federal Government to the individual in the very fundamental way." Justice Kennedy's skepticism does not bode well for the mandate. I am now going to go out on a limb and predict that it is likely the mandate will be struck down as unconstitutional. However, as I have said this possibility will not derail much else of health reform, and I believe the rest of the law will remain intact. A audio of Tuesday's arguments, as made available by the court, follows. A transcript of Tuesday's arguments, as prepared by the court, follows. CHIEF JUSTICE ROBERTS: We will continue argument this morning in Case 11-398, the Department of Health and Human Services v. Florida. The Affordable Care Act addresses a fundamental and enduring problem in our health care system and our economy. Insurance has become the predominant means of paying for health care in this country. Insurance has become the predominant means of paying for health care in this country. For most Americans, for more than 80 percent of Americans, the insurance system does provide effective access. Excuse me. But for more than 40 million Americans who do not have access to health insurance either through their employer or through government programs such as Medicare or Medicaid, the system does not work. Those individuals must resort to the individual market, and that market does not provide affordable health insurance. GENERAL VERRILLI: They can address it directly, Justice Scalia, and they are addressing it directly through this, through this Act by regulating the means by which health care, by which health care is purchased. That is the way this Act works. Under the Commerce Clause, what, what Congress has done is to enact reforms of the insurance market, directed at the individual insurance market, that preclude, that preclude discrimination based on pre-existing conditions, that require guaranteed issue and community rating, and it uses — and the minimum coverage provision is necessary to carry into execution those insurance reforms. GENERAL VERRILLI: That's not what's going on here, Justice Kennedy, and we are not seeking to defend the law on that basis. JUSTICE SCALIA: Any self purchasing? Anything I — you know if I'm in any market at all, my failure to purchase something in that market subjects me to regulation. GENERAL VERRILLI: No. That's not our position at all, Justice Scalia. In the health care market, the health care market is characterized by the fact that aside from the few groups that Congress chose to exempt from the minimum coverage requirement — those who for religious reasons don't participate, those who are incarcerated, Indian tribes — virtually everybody else is either in that market or will be in that market, and the distinguishing feature of that is that they cannot, people cannot generally control when they enter that market or what they need when they enter that market. CHIEF JUSTICE ROBERTS: Well, the same, it seems to me, would be true say for the market in emergency services: police, fire, ambulance, roadside assistance, whatever. You don't know when you're going to need it; you're not sure that you will. But the same is true for health care. You don't know if you're going to need a heart transplant or if you ever will. So there is a market there. To — in some extent, we all participate in it. So can the government require you to buy a cell phone because that would facilitate responding when you need emergency services? You can just dial 911 no matter where you are? CHIEF JUSTICE ROBERTS: It seems to me that's the same as in my hypothetical. You don't know when you're going to need police assistance. You can't predict the extent to emergency response that you'll need. But when you do, and the government provides it. I thought that was an important part of your argument, that when you need health care, the government will make sure you get it. Well, when you need police assistance or fire assistance or ambulance assistance, the government is going to make sure to the best extent it can that you get it — get it. GENERAL VERRILLI: For burial services? GENERAL VERRILLI: Yes, Justice Alito, I think there is. JUSTICE ALITO: Or a family member is going to pay. GENERAL VERRILLI: That's a difference and it's a significant difference. In this situation one of the economic effects Congress is addressing is that the — there — the many billions of dollars of uncompensated costs are transferred directly to other market participants. It's transferred directly to other market participants because health care providers charge higher rates in order to cover the cost of uncompensated care, and insurance companies reflect those higher rates in higher premiums, which Congress found translates to a thousand dollars per family in additional health insurance costs. JUSTICE ALITO: But isn't that a very small part of what the mandate is doing? You can correct me if these figures are wrong, but it appears to me that the CBO has estimated that the average premium for a single insurance policy in the non-group market would be roughly $5,800 in — in 2016. Respondents — the economists have supported — the Respondents estimate that a young, healthy individual targeted by the mandate on average consumes about $854 in health services each year. So the mandate is forcing these people to provide a huge subsidy to the insurance companies for other purposes that the act wishes to serve, but isn't — if those figures are right, isn't it the case that what this mandate is really doing is not requiring the people who are subject to it to pay for the services that they are going to consume? It is requiring them to subsidize services that will be received by somebody else. GENERAL VERRILLI: No, I think that — I do think that's what the Respondents argue. It's just not right. I think it — it really gets to a fundamental problem with their argument. JUSTICE GINSBURG: If you're going to have insurance, that's how insurance works. GENERAL VERRILLI: A, it is how insurance works, but, B, the problem that they — that they are identifying is not that problem. The — the guaranteed issue and community rating reforms do not have the effect of forcing insurance companies to take on lots of additional people who they then can't afford to cover because they're — they tend to be the sick, and that is — in fact, the exact opposite is what happens here. JUSTICE KENNEDY: Could you help — help me with this. Assume for the moment — you may disagree. Assume for the moment that this is unprecedented, this is a step beyond what our cases have allowed, the affirmative duty to act to go into commerce. If that is so, do you not have a heavy burden of justification? I understand that we must presume laws are constitutional, but, even so, when you are changing the relation of the individual to the government in this, what we can stipulate is, I think, a unique way, do you not have a heavy burden of justification to show authorization under the Constitution? GENERAL VERRILLI: That's correct, Justice Scalia, but you never know whether you're going to be that person. JUSTICE SCALIA: Is that a principal basis for distinguishing this from other situations? I mean, you know, you can also say, well, the person subject to this has blue eyes. That would indeed distinguish it from other situations. Is it a principle basis? I mean, it's — it's a basis that explains why the government is doing this, but is it — is it a basis which shows that this is not going beyond what — what the — the system of enumerated powers allows the government to do. GENERAL VERRILLI: Yes, for two reasons. First, this — the test, as this Court has articulated it, is: Is Congress regulating economic activity with a substantial effect on interstate commerce? JUSTICE GINSBURG: Mr. Verrilli, I thought that your main point is that, unlike food or any other market, when you made the choice not to buy insurance, even though you have every intent in the world to self-insure, to save for it, when disaster strikes, you may not have the money. And the tangible result of it is — we were told there was one brief that Maryland Hospital Care bills 7 percent more because of these uncompensated costs, that families pay a thousand dollars more than they would if there were no uncompensated costs. I thought what was unique about this is it's not my choice whether I want to buy a product to keep me healthy, but the cost that I am forcing on other people if I don't buy the product sooner rather than later. GENERAL VERRILLI: That is — and that is definitely a difference that distinguishes this market and justifies this as a regulation. JUSTICE BREYER: All right. So if that is your difference — if that is your difference, I'm somewhat uncertain about your answers to — for example, Justice Kennedy asked, can you, under the Commerce Clause, Congress create commerce where previously none existed. Well, yeah, I thought the answer to that was, since McCulloch versus Maryland, when the Court said Congress could create the Bank of the United States which did not previously exist, which job was to create commerce that did not previously exist, since that time the answer has been, yes. I would have thought that your answer — can the government, in fact, require you to buy cell phones or buy burials that, if we propose comparable situations, if we have, for example, a uniform United States system of paying for every burial such as Medicare Burial, Medicaid Burial, CHIP Burial, ERISA Burial and Emergency Burial beside the side of the road, and Congress wanted to rationalize that system, wouldn't the answer be, yes, of course, they could. JUSTICE BREYER: And the same with the computers or the same with the — the cell phones, if you're driving by the side of the highway and there is a federal emergency service just as you say you have to buy certain mufflers for your car that don't hurt the environment, you could — I mean, see, doesn't it depend on the situation? GENERAL VERRILLI: My responsibility — and I would defend them on a rationale like that, but I do think that we are advancing a narrower rationale. JUSTICE KENNEDY: Well, then your question is whether or not there are any limits on the Commerce Clause. Can you identify for us some limits on the Commerce Clause? JUSTICE KENNEDY: But why not? If Congress — if Congress says that the interstate commerce is affected, isn't, according to your view, that the end of the analysis. GENERAL VERRILLI: No. The, the — we think that in a — when — the difference between those situations and this situation is that in those situations, Your Honor, Congress would be moving to create commerce. Here Congress is regulating existing commerce, economic activity that is already going on, people's participation in the health care market, and is regulating to deal with existing effects of existing commerce. CHIEF JUSTICE ROBERTS: That — that it seems to me, it's a — it's a passage in your reply brief that I didn't quite grasp. It's the same point. You say health insurance is not purchased for its own sake, like a car or broccoli; it is a means of financing health care consumption and covering universal risks. Well, a car or broccoli aren't purchased for their own sake, either. They are purchased for the sake of transportation or in broccoli, covering the need for food. I — I don't understand that distinction. CHIEF JUSTICE ROBERTS: Well, now that's a significant — I'm sorry. GENERAL VERRILLI: But I do think that's the difference between existing commerce activity in the market already occurring — the people in the health care market purchasing, obtaining health care services — and the creation of commerce. And the principle that we are advocating here under the Commerce Clause does not take the step of justifying the creation of commerce. It's a regulation of the existing commerce. -can we go back to, Justice Breyer asked a question, and it kind of interrupted your answer to my question. And tell me if I'm wrong about this, but I thought a major, major point of your argument was that the people who don't participate in this market are making it much more expensive for the people who do; that is, they -­they will get, a good number of them will get services that they can't afford at the point where they need them, and the result is that everybody else's premiums get raised. So you're not — it's not your — your free choice just to do something for yourself. What you do is going to affect others, affect them in — in a major way. GENERAL VERRILLI: That — that absolutely is a justification for Congress's action here. That is existing economic activity that Congress is regulating by means of this rule. JUSTICE SCALIA: General Verrilli, you -­you could say that about buying a car. If — if people don't buy cars, the price that those who do buy cars pay will have to be higher. So you could say in order to bring the price down, you are hurting these other people by not buying a car. GENERAL VERRILLI: That is not what we are saying, Justice Scalia. JUSTICE SCALIA: That's not — that's not what you're saying. JUSTICE SCALIA: I thought it was. I thought you were saying other people are going to have to pay more for insurance because you're not buying it. GENERAL VERRILLI: No. It's because you're going — in the health care market, you're going into the market without the ability to pay for what you get, getting the health care service anyway as a result of the social norms that allow — that — to which we've obligated ourselves so that people get health care. JUSTICE SCALIA: Well, don't obligate yourself to that. Why — you know? GENERAL VERRILLI: Well, I can't imagine that that — that the Commerce Clause would —would forbid Congress from taking into account this deeply embedded social norm. JUSTICE SCALIA: You — you could do it. But — but does that expand your ability to, to issue mandates to — to the people? GENERAL VERRILLI: — or — or inevitably will consume. JUSTICE SOTOMAYOR: General, I see or have seen three strands of arguments in your briefs, and one of them is echoed today. The first strand that I have seen is that Congress can pass any necessary laws to effect those powers within its rights, i.e., because it made a decision that to effect, to effect mandatory issuance of insurance, that it could also obligate the mandatory purchase of it. The second strand I see is self-insurance affects the market, and so the government can regulate those who self-insure. And the third argument — and I see all of them as different — is that what the government is doing, and I think it's the argument you're making today — that what the — what the government is saying is if you pay for — if you use health services, you have to pay with insurance. Because only insurance will guarantee that whatever need for health care that you have will be covered. Because virtually no one, perhaps with the exception of 1 percent of the population, can afford the massive cost if the unexpected happens. This third argument seems to be saying what we are regulating is health care, and when you go for health services, you have to pay for insurance, and since insurance won't issue at the moment that you consume the product, we can reasonably, necessarily tell you to buy it ahead of time, because you can't buy it at the moment that you need it. GENERAL VERRILLI: So, let me try to state it this way. The Congress enacted reforms of the insurance market, the guaranteed-issue and community-rating reforms. It did so to deal with a very serious problem that results in 40 million people not being able to get insurance and therefore not access to the health care environment. Everybody agrees in this case that those are within Congress's Article I powers. JUSTICE SOTOMAYOR: So on that ground, you're answering affirmatively to my colleagues that have asked you the question, can the government force you into commerce. GENERAL VERRILLI: So — no. JUSTICE SOTOMAYOR: And there is no limit to that power. GENERAL VERRILLI: No. No. Because that's — that's the first part of our argument. The second part of our argument is that the means here that the Congress has chosen, the minimum coverage provision, is a means that regulates the -­that regulates economic activity, namely your transaction in the health care market, with substantial effects on interstate commerce; and it is the conjunction of those two that we think provides the particularly secure foundation for this statute under the commerce power. JUSTICE KAGAN: General, you've talked on -­a couple of times about other alternatives that Congress might have had, other alternatives that the Respondents suggest to deal with this problem, in particular, the alternative of mandating insurance at the point at which somebody goes to a hospital or an emergency room and asks for care. Did Congress consider those alternatives? Why did it reject them? How should we think about the question of alternative ways of dealing with these problems? GENERAL VERRILLI: I do think, Justice Kagan, that the point of difference between my friends on the other side and the United States is about one of timing. They have agreed that Congress has Article I authority to impose an insurance requirement or other -­or other penalty at the point of sale, and they have agreed that Congress has the authority to do that to achieve the same objectives that the minimum coverage provision of the Affordable Care Act is designed to achieve. This is a situation if which we are talking about means. Congress gets a substantial deference in the choice of means, and if one thinks about the difference between the means they say Congress should have chosen and the means Congress did choose, I think you can see why it was eminently more sensible for Congress to choose the means that it chose. JUSTICE KENNEDY: I'm not sure which way it cuts. If the Congress has alternate means, let's assume it can use the tax power to raise revenue and to just have a national health service, single payer. How does that factor into our analysis? In the one sense, it can be argued that this is what the government is doing; it ought to be honest about the power that it's using and use the correct power. On the other hand, it means that since the Court can do it anyway — Congress can do it anyway, we give a certain amount of latitude. I'm not sure which the way the argument goes. GENERAL VERRILLI: Let me try to answer that question, Justice Kennedy, and get back to the question you asked me earlier. The, the — I do think one striking feature of the argument here that this is a novel exercise of power is that what Congress chose to do was to rely on market mechanisms and efficiency and a method that has more choice than would the traditional Medicare/Medicaid type model; and so it seems a little ironic to suggest that that counts against it. JUSTICE SCALIA: Oh, no, it's not. They all involved commerce. There was no doubt that was what regulated was commerce. And here you're regulating somebody who isn't covered. By the way, I don't agree with you that the relevant market here is health care. You're not regulating health care. You're regulating insurance. It's the insurance market that you're addressing and you're saying that some people who are not in it must be in it and that's — that's difference from regulating in any manner commerce that already exists out there. GENERAL VERRILLI: Well, to the extent that we are looking at the comprehensive scheme, Justice Scalia, it is regulating commerce that already exists out there. And the means in which that regulation is made effective here, the minimum coverage provision, is a regulation of the way in which people participate, the method of their payment in the health care market. That is what it is. And I do think, Justice Kennedy, getting back to the question you asked before, what — what matters here is whether Congress is choosing a tool that's reasonably adapted to the problem that Congress is confronting. And that may mean that the tool is different from a tool that Congress has chosen to use in the past. That's not something that counts against the provision in a Commerce Clause analysis. JUSTICE SCALIA: Wait. That's — that's -­it's both "Necessary and Proper." What you just said addresses what's necessary. Yes, has to be reasonably adapted. Necessary does not mean essential, just reasonably adapted. But in addition to being necessary, it has to be proper. And we've held in two cases that something that was reasonably adapted was not proper because it violated the sovereignty of the States, which was implicit in the constitutional structure. The argument here is that this also is — may be necessary, but it's not proper because it violates an equally evident principle in the Constitution, which is that the Federal Government is not supposed to be a government that has all powers; that it's supposed to be a government of limited powers. And that's what all this questioning has been about. What — what is left? If the government can do this, what, what else can it not do? JUSTICE SCALIA: No, that wasn't my point. That is not the only constitutional principle that exists. JUSTICE SCALIA: An equally evident constitutional principle is the principle that the Federal Government is a government of enumerated powers and that the vast majority of powers remain in the States and do not belong to the Federal Government. Do you acknowledge that that's a principle? JUSTICE SCALIA: Okay. That's what we are talking about here. GENERAL VERRILLI: And the way in which this Court in its cases has policed the boundary that — of what's in the national sphere and what's in the local sphere is to ask whether Congress is regulating economic activity with a substantial effect on interstate commerce. And here I think it's really impossible, in view of our history, to say that Congress is invading the State sphere. This is a — this is a market in which 50 percent of the people in this country get their health care through their employer. There is a massive Federal tax subsidy of $250 billion a year that makes that much more affordable. ERISA and HIPAA regulate that to ensure that the kinds of bans on pre-existing condition discrimination and pricing practices that occur in the individual market don't occur. CHIEF JUSTICE ROBERTS: The key in Lochner is that we were talking about regulation of the States, right, and the States are not limited to enumerated powers. The Federal Government is. And it seems to me it's an entirely different question when you ask yourself whether or not there are going to be limits in the Federal power, as opposed to limits on the States, which was the issue in Lochner. Mr. Chief Justice, that what the Court has said as I read the Court's cases is that the way in which you ensure that the Federal Government stays in its sphere and the sphere reserved for the States is protected is by policing the boundary: Is the national government regulating economic activity with a substantial effect on interstate commerce? JUSTICE KENNEDY: But the reason, the reason this is concerning, is because it requires the individual to do an affirmative act. In the law of torts our tradition, our law, has been that you don't have the duty to rescue someone if that person is in danger. The blind man is walking in front of a car and you do not have a duty to stop him absent some relation between you. And there is some severe moral criticisms of that rule, but that's generally the rule. GENERAL VERRILLI: I don't think so, Justice Kennedy, because it is predicated on the participation of these individuals in the market for health care services. Now, it happens to be that this is a market in which, aside from the groups that the statute excludes, virtually everybody participates. But it is a regulation of their participation in that market. CHIEF JUSTICE ROBERTS: Well, but it's critical how you define the market. If I understand the law, the policies that you're requiring people to purchase involve — must contain provision for maternity and newborn care, pediatric services, and substance use treatment. It seems to me that you cannot say that everybody is going to need substance use treatment, substance use treatment or pediatric services, and yet that is part of what you require them to purchase. CHIEF JUSTICE ROBERTS: But your theory is that there is a market in which everyone participates because everybody might need a certain range of health care services, and yet you're requiring people who are not — never going to need pediatric or maternity services to participate in that market. CHIEF JUSTICE ROBERTS: I think you're posing the question I was posing, which is that doesn't apply to a lot of what you're requiring people to purchase: Pediatric services, maternity services. You cannot say that everybody is going to participate in the substance use market and yet you require people to purchase insurance coverage for that. GENERAL VERRILLI: Congress has got —Congress is enacting economic regulation here. It has latitude to define essential, the attributes of essential coverage. That doesn't — that doesn't seem to me to implicate the question of whether Congress is engaging in economic regulation and solving an economic problem here, and that is what Congress is doing. JUSTICE ALITO: The point is — no, you take into account that some people in that group are going to be hit by a bus, some people in that group are going to unexpectedly contract or be diagnosed with a disease that — that is very expensive to treat. But if you take their costs and you calculate that, that's a lot less than the amount that they are going to be required to pay. GENERAL VERRILLI: Well, the — the people in that class get benefits, too, Justice Alito. They get the guaranteed-issue benefit that they would not otherwise have, which is an enormously valuable benefit. JUSTICE SCALIA: Only if you make phone calls. GENERAL VERRILLI: — because that's the judgment Congress has made. JUSTICE KAGAN: — Verrilli, because in this context, the subsidizers eventually become the subsidized? JUSTICE SCALIA: We're not stupid. They're going to buy insurance later. They're young and — and need the money now. JUSTICE SCALIA: When — when they think they have a substantial risk of incurring high medical bills, they'll buy insurance, like the rest of us. JUSTICE SCALIA: — I don't know why you think that they're never going to buy it. GENERAL VERRILLI: That's the problem, Justice Scalia. That's — and that's exactly the experience that the States had that made the imposition of guaranteed-issue and community rating not only be ineffectual but be highly counterproductive. Rates, for example, in New Jersey doubled or tripled, went from 180,000 people covered in this market down to 80,000 people covered in this market. In Kentucky, virtually every insurer left the market. And the reason for that is because when people have that guarantee of — that they can get insurance, they're going to make that calculation that they won't get it until they're sick and they need it, and so the pool of people in the insurance market gets smaller and smaller. The rates you have to charge to cover them get higher and higher. It helps fewer and fewer — insurance covers fewer and fewer people until the system ends. JUSTICE SCALIA: You could solve that problem by simply not requiring the insurance company to sell it to somebody who has a — a condition that is going to require medical treatment, or at least not -­not require them to sell it to him at — at a rate that he sells it to healthy people. But you don't want to do that. JUSTICE SCALIA: That seems to me a self-created problem. JUSTICE SCALIA: — whatever problems Congress's economic regulation produces, whatever they are, I think Congress can do something to counteract them. Here, requiring somebody to enter — to enter the insurance market. GENERAL VERRILLI: This is not a — it's not a problem of Congress's creation. The problem is that you have 40 million people who cannot get affordable insurance through the means that the rest of us get affordable insurance. Congress, after a long study and careful deliberation, and viewing the experiences of the States and the way they tried to handle this problem, adopted a package of reforms. Guaranteed-issue and community rating, and — and subsidies and the minimum coverage provision are a package of reforms that solve that problem. I don't — I think it's highly artificial to view this as a problem of Congress's own creation. CHIEF JUSTICE ROBERTS: Is your argument limited to insurance or means of paying for health care? GENERAL VERRILLI: Yes. It's limited to insurance. CHIEF JUSTICE ROBERTS: Well, now why is that? Congress could — once you — once you establish that you have a market for health care, I would suppose Congress's power under the Commerce Clause meant they had a broad scope in terms of how they regulate that market. And it would be — it would be going back to Lochner if we were put in the position of saying no, you can use your commerce power to regulate insurance, but you can't use your commerce power to regulate this market in other ways. I think that would be a very significant intrusion by the Court into Congress's power. So I don't see how we can accept your -­it's good for you in this case to say oh, it's just insurance. But once we say that there is a market and Congress can require people to participate in it, as some would say — or as you would say, that people are already participating in it — it seems to me that we can't say there are limitations on what Congress can do under its commerce power, just like in any other area, all — given significant deference that we accord to Congress in this area, all bets are off, and you could regulate that market in any rational way. CHIEF JUSTICE ROBERTS: And you're worried — that's the area that Congress has chosen to regulate. There's this health care market. Everybody's in it. So we can regulate it, and we're going to look at a particular serious problem, which is how people pay for it. But next year, they can decide everybody's in this market, we're going to look at a different problem now, and this is how we're going to regulate it. And we can compel people to do things — purchase insurance, in this case. Something else in the next case, because you've — we've accepted the argument that this is a market in which everybody participates. GENERAL VERRILLI: Mr. Chief Justice, let me answer that, and then if I may, I'd like to move to the tax power argument. JUSTICE SCALIA: Can — can I tell you what the something else is so — while you're answering it? The something else is everybody has to exercise, because there's no doubt that lack of exercise cause — causes illness, and that causes health care costs to go up. So the Federal government says everybody has to — to join a — an exercise club. That's — that's the something else. GENERAL VERRILLI: No. The — the position we're taking here would not justify that rule, Justice Scalia, because health club membership is not a means of payment for — for consumption of anything in — in a market. CHIEF JUSTICE ROBERTS: Right. Right. That's — that's exactly right, but it doesn't seem responsive to my concern that there's no reason — once we say this is within Congress's commerce power, there's no reason other than our own arbitrary judgment to say all they can regulate is the method of payment. They can regulate other things that affect this now-conceded interstate market in health care in which everybody participates. CHIEF JUSTICE ROBERTS: — unless I'm missing something, I think you're just repeating the idea that this is the regulation of the method of payment. And I understand that argument. And it may be — it may be a good one. But what I'm concerned about is, once we accept the principle that everybody is in this market, I don't see why Congress's power is limited to regulating the method of payment and doesn't include as it does in any other area. What other area have we said Congress can regulate this market but only with respect to prices, but only with respect to means of travel? No. Once you're — once you're in the interstate commerce and can regulate it, pretty much all bets are off. JUSTICE ALITO: Could you just — before you move on, could you express your limiting principle as succinctly as you possibly can? Congress can force people to purchase a product where the failure to purchase the product has a substantial effect on interstate commerce — if what? If this is part of a larger regulatory scheme? Was that it? Was there anything more? GENERAL VERRILLI: We got two and they are — they are different. Let me state them. First with respect to the comprehensive scheme. When Congress is regulating — is enacting a comprehensive scheme that it has the authority to enact that the Necessary and Proper Clause gives it the authority to include regulation, including a regulation of this kind, if it is necessary to counteract risks attributable to the scheme itself that people engage in economic activity that would undercut the scheme. It's like — it's very much like Wickard in that respect, very much like Raich in that respect. With respect to the — with respect to the — considering the Commerce Clause alone and not embedded in the comprehensive scheme, our position is that Congress can regulate the method of payment by imposing an insurance requirement in advance of the time in which the — the service is consumed when the class to which that requirement applies either is or virtually is most certain to be in that market when the timing of one's entry into that market and what you will need when you enter that market is uncertain and when — when you will get the care in that market, whether you can afford to pay for it or not and shift costs to other market participants. So those — those are our views as to -­those are the principles we are advocating for and it's, in fact, the conjunction of the two of them here that makes this, we think, a strong case under the Commerce Clause. JUSTICE SOTOMAYOR: General, could you turn to the tax clause? JUSTICE SOTOMAYOR: I have to look for a case that involves the issue of whether something denominated by Congress as a penalty was nevertheless treated as a tax, except in those situations where the code itself or the statute itself said treat the penalty as a tax. Do you know of any case where we've done that? JUSTICE SCALIA: But fees, you know, license fees, fees for a hunting license, everybody knows those are taxes. I mean, I don't think there is as much of a difference between a fee and a tax as there is between a penalty and a tax. GENERAL VERRILLI: And that, and — and I think in terms of the tax part, I think it's useful to separate this into two questions. One is a question of characterization. Can this be characterized as a tax; and second, is it a constitutional exercise of the power? JUSTICE GINSBURG: But yesterday you told me — you listed a number of penalties that are enforced through the tax code that are not taxes and they are not penalties related to taxes. GENERAL VERRILLI: They may still be exercise of the tax — exercises of the taxing power, Justice Ginsburg, as — as this is, and I think there isn't a case in which the Court has, to my mind, suggested anything that bears this many indicia of a tax can't be considered as an exercise of the taxing power. In fact, it seems to me the License Tax Cases point you in the opposite direction. And beyond that your -­the — it seems to me the right way to think about this question is whether it is capable of being understood as an exercise of the tax. JUSTICE SCALIA: The President said it wasn't a tax, didn't he? GENERAL VERRILLI: The President said it wasn't a tax increase because it ought to be understood as an incentive to get people to have insurance. I don't think it's fair to infer from that anything about whether that is an exercise of the tax power or not. JUSTICE GINSBURG: A tax is to raise revenue, tax is a revenue-raising device, and the purpose of this exaction is to get people into the health care risk — risk pool before they need medical care, and so it will be successful. If it doesn't raise any revenue, if it gets people to buy the insurance, that's — that's what this penalty is — this penalty is designed to affect conduct. The conduct is buy health protection, buy health insurance before you have a need for medical care. That's what the penalty is designed to do, not to raise revenue. GENERAL VERRILLI: That — that is true, Justice Ginsburg. This is also true of the marijuana tax that was withheld in Sanchez. That's commonly true of penalties under the Code. They do — if they raise revenue, they are exercises of the taxing power, but their purpose is not to raise revenue. Their purpose is to discourage behavior. JUSTICE KAGAN: I suppose, though, General, one question is whether the determined efforts of Congress not to refer to this as a tax make a difference. I mean, you're suggesting we should just look to the practical operation. We shouldn't look at labels. And that seems right, except that here we have a case in which Congress determinedly said this is not a tax, and the question is why should that be irrelevant? GENERAL VERRILLI: I don't think that that's a fair characterization of the actions of Congress here, Justice Kagan. On the — December 23rd, a point of constitutional order was called to, in fact, with respect to this law. The floor sponsor, Senator Baucus, defended it as an exercise of the taxing power. In his response to the point of order, the Senate voted 60 to39 on that proposition. Congress was avoiding any mention of the tax power. It would be one thing if Congress explicitly disavowed an exercise of the tax power. But given that it hasn't done so, it seems to me that it's — not only is it fair to read this as an exercise of the tax power, but this Court has got an obligation to construe it as an exercise of the tax power, if it can be upheld on that basis. CHIEF JUSTICE ROBERTS: Why didn't Congress call it a tax, then? CHIEF JUSTICE ROBERTS: You're telling me they thought of it as a tax, they defended it on the tax power. Why didn't they say it was a tax? CHIEF JUSTICE ROBERTS: Well, that's the reason. They thought it might be more effective if they called it a penalty. JUSTICE SOTOMAYOR: General, the problem goes back to the limiting principle. Is this simply anything that raises revenue that Congress can do? GENERAL VERRILLI: — taxing power, and they — and I think, of course, the Constitution imposes some, got to be uniform, can't be taxed on exports, if it's a direct tax, it's got to be apportioned. Beyond that, the limiting principle, as the Court has identified from Drexel Furniture to Kurth Ranch, is that it can't be punishment, punitive in the guise of a tax. And there are three factors of Court has identified to look at that. The first is the sanction and how disproportionate it is to the conduct; the second is whether there is scienter; and the third is whether there is an — an — an administrative apparatus out there to enforce the tax. Now in — in Bailey v. Drexel Furniture, for example, the tax was 10 percent of the company's profits, even if they had only one child laborer for one day. There was a scienter requirement, and it was enforced by the Department of Labor. It wasn't just collected by the Internal Revenue Service. JUSTICE ALITO: Can the — can the mandate be viewed as tax if it does impose a requirement on people who are not subject to the penalty or the tax? JUSTICE SCALIA: You're saying that all the discussion we had earlier about how this is one big uniform scheme and the Commerce Clause blah, blah, blah, it really doesn't matter. This is a tax and the Federal Government could simply have said, without all of the rest of this legislation, could simply have said everybody who doesn't buy health insurance at a certain age will be taxed so much money, right? JUSTICE SCALIA: Yes, but you didn't need that. JUSTICE SCALIA: You didn't need that. If it's a tax, it's only — raising money is enough. GENERAL VERRILLI: It's justifiable under its tax power. GENERAL VERRILLI: If I may reserve the balance of my time. CHIEF JUSTICE ROBERTS: Thank you, gentlemen. We'll take a pause for a minute or so, Mr. Clement. CHIEF JUSTICE ROBERTS: Why don't we get started again. ON BEHALF OF THE RESPONDENTS FLORIDA, ET AL. MR. CLEMENT: Mr. Chief Justice and may it please the Court. The mandate represents an unprecedented effort by Congress to compel individuals to enter commerce in order to better regulate commerce. Now, Congress when it passed the statute did make findings about why it thought it could regulate the commerce here, and it justified the mandate as a regulation of the economic decision to forego the purchase of health insurance. That is a theory without any limiting principle. JUSTICE SOTOMAYOR: Do you accept your -­the General's position that you have conceded that Congress could say, if you're going to consume health services, you have to pay by way of insurance? MR. CLEMENT: That's right, Justice Sotomayor. We say, consistent with 220 years of this Court's jurisprudence, that if you regulate the point of sale, you regulate commerce, that's within Congress' commerce power. JUSTICE SOTOMAYOR: All right. So what do you do with the impossibility of buying insurance at the point of consumption. Virtually, you force insurance companies to sell it to you? MR. CLEMENT: Well, Justice, I think there is two points to make on that. One is, a lot of the discussion this morning so far has proceeded on the assumption that the only thing that is at issue here is emergency room visits, and the only thing that's being imposed is catastrophic care coverage; but, as the Chief Justice indicated earlier, a lot of the insurance that's being covered is for ordinary preventive care, ordinary office visits, and those are the kinds of things that one can predict. So there is a big part of the market that's regulated here that wouldn't pose the problem that you're suggesting; but, even as to emergency room visits, it certainly would be possible to regulate at that point. You could simply say, through some sort of mandate on the insurance companies, you have to provide people that come in — this will be a high-risk pool, and maybe you will have to share it amongst yourself or something, but people simply have to sign up at that point, and that would be regulating at the point of sale. JUSTICE KAGAN: Well, Mr. Clement, now it seems as though you're just talking about a matter of timing; that Congress can regulate the transaction, and the question is when does it make best sense to regulate that transaction? And Congress surely has within its authority to decide, rather than at the point of sale, given an insurance-based mechanism, it makes sense to regulate it earlier. It's just a matter of timing. MR. CLEMENT: Well, Justice Kagan, we don't think it's a matter of timing alone, and we think it has very substantive effects. Because if Congress tried to regulate at the point of sale, the one group that it wouldn't capture at all are the people who don't want to purchase health insurance and also have no plans of using health care services in the near term. And Congress very much wanted to capture those people. I mean, those people are essentially the golden geese that pay for the entire lowering of the premium. JUSTICE KENNEDY: Was the government's argument this — and maybe I won't state it accurately — it is true that the noninsured young adult is, in fact, an actuarial reality insofar as our allocation of health services, insofar as the way health insurance companies figure risks? That person who is sitting at home in his or her living room doing nothing is an actuarial reality that can and must be measured for health service purposes; is that their argument? MR. CLEMENT: Well, I don't know, Justice Kennedy, but, if it is, I think there is at least two problems with it. One is, as Justice Alito's question suggested earlier, I mean, somebody who is not in the insurance market is sort of irrelevant as an actuarial risk. I mean, we could look at the people not in the insurance market, and what we'd find is that they're relatively young, relatively healthy, and they would have a certain pool of actuarial risks that would actually lead to lower premiums. The people that would be captured by guaranteed rating and community issue — guaranteed issue and community rating would presumably have a higher risk profile, and there would be higher premiums. And one of the things, one of the things Congress sought to accomplish here, was to force individuals into the insurance market to subsidize those that are already in it to lower the rates. And that's just not my speculation, that's Finding I at 43A of the government's brief that — it has the statute. And that's one of the clear findings. JUSTICE GINSBURG: Mr. Clement, doesn't that work — that work the way Social Security does? It was a big fuss about that in the beginning because a lot of people said — maybe some people still do today — I could do much better if the government left me alone. I'd go into the private market, I'd buy an annuity, I'd make a great investment, and they're forcing me to paying for this Social Security that I don't want; but, that's constitutional. So if Congress could see this as a problem when we need to have a group that will subsidize the ones who are going to get the benefits, it seems to me you are saying the only way that could be done is if the government does it itself; it can't involve the private market, it can't involve the private insurers. If it wants to do this, Social Security is its model. The government has to do — has to be government takeover. We can't have the insurance industry in it. Is that your position? MR. CLEMENT: No. I don't think it is, Justice Ginsburg. I think there are other options that are available. The most straightforward one would be to figure out what amount of subsidy to the insurance industry is necessary to pay for guaranteed issue and community rating. And once we calculate the amount of that subsidy, we could have a tax that's spread generally through everybody to raise the revenue to pay for that subsidy. That's the way we pay for most subsidies. JUSTICE SOTOMAYOR: Could we have an exemption? Could the government say, everybody pays a shared health care responsibility payment to offset all the money that we are forced to spend on health care, we the government; but, anybody who has an insurance policy is exempt from that tax? Could the government do that? MR. CLEMENT: The government might be able to do that. I think it might raise some issues about whether or not that would be a valid exercise of the taxing power. JUSTICE SOTOMAYOR: Under what theory wouldn't it be? JUSTICE SOTOMAYOR: We get tax credits for having solar-powered homes. We get tax credits for using fuel efficient cars. Why couldn't we get a tax credit for having health insurance and saving the government from caring for us. MR. CLEMENT: Well, I think it would depend a little bit on how it was formulated; but, my concern would be — the constitutional concern would be that it would just be a disguised impermissible direct tax. And I do think — I mean, I don't want to suggest we get to the taxing power to soon, but I do think it's worth realizing that the taxing power is limited in the ability to impose direct taxes. And the one thing I think the framers would have clearly identified as a direct tax is a tax on not having something. I mean, the framing generation was divided over whether a tax on carriages was a direct tax or not. Hamilton thought that was a indirect tax; Madison thought it was a direct tax. I have little doubt that both of them would have agreed that a tax on not having a carriage would have clearly been a direct tax. I also think they would have thought it clearly wasn't a valid regulation of the market in carriages. JUSTICE BREYER: Let me ask — can I go back for a step, because I don't want to get into a discussion of whether this is a good bill or not. Some people think it's going to save a lot of money. Some people think it won't. So I'm focusing just on the Commerce Clause; not on the Due Process Clause, the Commerce Clause. And I look back into history, and I think if we look back into history we see sometimes Congress can create commerce out of nothing. That's the national bank, which was created out of nothing to create other commerce out of nothing. I look back into history, and I see it seems pretty clear that if there are substantial effects on interstate commerce, Congress can act. And I look at the person who's growing marijuana in her house, or I look at the farmer who is growing the wheat for home consumption. This seems to have more substantial effects. Is this commerce? Well, it seems to me more commerce than marijuana. I mean, is it, in fact, a regulation? Well, why not? If creating a bank is, why isn't this? And then you say, ah, but one thing here out of all those things is different, and that is you're making somebody do something. I say, hey, can't Congress make people drive faster than 45 — 40 miles an hour on a road? Didn't they make that man growing his own wheat go into the market and buy other wheat for his — for his cows? Didn't they make Mrs. — if she married somebody who had marijuana in her basement, wouldn't she have to go and get rid of it? Affirmative action? I mean, where does this distinction come from? It sounds like sometimes you can, and sometimes you can't. So what is argued here is there is a large group of — what about a person that we discover that there are — a disease is sweeping the United States, and 40 million people are susceptible, of whom 10 million will die; can't the Federal Government say all 40 million get inoculation? So here, we have a group of 40 million, and 57 percent of those people visit emergency care or other care, which we are paying for. And 22 percent of those pay more than $100,000 for that. And Congress says they are in the midst of this big thing. We just want to rationalize this system they are already in. JUSTICE SCALIA: We'll get to those questions in inverse order. JUSTICE BREYER: Well, no, it's one question. It's looking back at that — looking back at that history. The thing I can see that you say to some people, go buy; why does that make a difference in terms of the Commerce Clause? MR. CLEMENT: No, the bank was not justified and the corporation was not justified as an exercise of commerce power. So that is not a case that says that it's okay to conjure up the bank as an exercise of the commerce power. What, of course, the Court didn't say, and I think the Court would have had a very different reaction to, is, you know, we are not just going to have the bank, because that wouldn't be necessary and proper, we are going to force the citizenry to put all of their money in the bank, because, if we do that, then we know the Bank of the United States will be secure. I think the framers would have identified the difference between those two scenarios, and I don't think that the great Chief Justice would have said that forcing people to put their deposits in the Bank of the United States was necessary and proper. Now, if you look through all the cases you mentioned, I do not think you will find a case like this. And I think it's telling that you won't. I mean, the regulation of the wheat market in Wickard against Filburn, all this effort to address the supply side and what producers could do, what Congress was trying to do was support the price of wheat. It would have been much more efficient to just make everybody in America buy 10 loaves of bread. That would have had a much more direct effect on the price of wheat in the prevailing market. CHIEF JUSTICE ROBERTS: Well, Mr. Clement, the key to the government's argument to the contrary is that everybody is in this market. It's all right to regulate Wickard — again, in Wickard against Filburn, because that's a particular market in which the farmer had been participating. Everybody is in this market, so that makes it very different than the market for cars or the other hypotheticals that you came up with, and all they're regulating is how you pay for it. MR. CLEMENT: Well, with respect, Mr. Chief Justice, I suppose the first thing you have to say is what market are we talking about? Because the government — this statute undeniably operates in the health insurance market. And the government can't say that everybody is in that market. The whole problem is that everybody is not in that market, and they want to make everybody get into that market. JUSTICE KAGAN: Well, doesn't that seem a little bit, Mr. Clement, cutting the bologna thin? mean, health insurance exists only for the purpose of financing health care. The two are inextricably interlinked. We don't get insurance so that we can stare at our insurance certificate. We get it so that we can go and access health care. MR. CLEMENT: Well, Justice Kagan, I'm not sure that's right. I think what health insurance does and what all insurance does is it allows you to diversify risk. And so it's not just a matter of I'm paying now instead I'm paying later. That's credit. Insurance is different than credit. Insurance guarantees you an upfront, locked-in payment, and you won't have to pay any more than that even if you incur much great expenses. JUSTICE SOTOMAYOR: But we don't in car insurance, meaning we tell people, buy car — not we, the states do, although you're going to — I'll ask you the question, do you think that if some states decided not to impose an insurance requirement, that the Federal Government would be without power to legislate and require every individual to buy car insurance? JUSTICE SOTOMAYOR: Well, that goes back to the substantive due process question. Is this a Lochner era argument that only the states can do this, even though it affects commerce? Cars indisputably affect commerce. So are you arguing that because the states have done it all along, the Federal Government is no longer permitted to legislate in this area? JUSTICE SOTOMAYOR: Health insurance — I mean, I've never gotten into an accident, thankfully, and I hope never. The vast majority of people have never gotten into an accident where they have injured others; yet, we pay for it dutifully every year on the possibility that at some point we might get into that accident. MR. CLEMENT: But, Justice Sotomayor, what I think is different is there is lots of people in Manhattan, for example, that don't have car insurance because they don't have cars. And so they have the option of withdrawing from that market. It's not a direct imposition from the government. JUSTICE SOTOMAYOR: But you're — but the given is that virtually everyone, absent some intervention from above, meaning that someone's life will be cut short in a fatal way, virtually everyone will use health care. MR. CLEMENT: At some point, that's right, but all sorts of people will not, say, use health care in the next year, which is the relevant period for the insurance. JUSTICE BREYER: But do you think you can, better than the actuaries or better than the members of Congress who worked on it, look at the 40 million people who are not insured and say which ones next year will or will not use, say, emergency care? JUSTICE BREYER: — and we don't know which? MR. CLEMENT: Of course not, Justice Breyer, but the point is that once Congress decides it's going to regulate extant commerce, it is going to get all sorts of latitude to make the right judgments about actuarial predictions, which actuarial to rely on, which one not to rely on. The question that's a proper question for this Court, though, is whether or not, for the first time ever in our history, Congress also has the power to compel people into commerce, because, it turns out, that would be a very efficient things for purposes of Congress' optimal regulation of that market. JUSTICE KAGAN: But, Mr. Clement, this goes back to the Chief Justice's question. But, of course, the theory behind, not just the government's case, but the theory behind this law is that people are in this market right now, and they are in this market because people do get sick, and because when people get sick, we provide them with care without making them pay. And it that would be different, you know, if you were up here saying, I represent a class of Christian scientists. Then you might be able to say, look, you know, why are they bothering me. But absent that, you're in this market. You're an economic actor. JUSTICE KAGAN: Well, we are talking about the health insurance market, which is designed to access the health care market. MR. CLEMENT: And with respect to the health insurance market that's designed to have payment in the health care market, everybody is not in the market. And that's the premise of the statute, and that's the problem Congress is trying to solve. MR. CLEMENT: Well, Justice Kennedy, I don't think that's right, certainly in any way that distinguishes this from any other context. When I'm sitting in my house deciding I'm not to buy a car, I am causing the labor market in Detroit to go south. I am causing maybe somebody to lose their job, and for everybody to have to pay for it under welfare. So the cost shifting that the government tries to uniquely to associate with this market, it is everywhere. And even more to the point, the rationale that they think ultimately supports this legislation, that look, it's an economic decision, once you make the economic decision, we aggregate the decision, there is a substantial effect on commerce. That argument works here. It works in every single industry. JUSTICE BREYER: Of course we do know that there are a few people, more in New York City than there are in Wyoming, who never will buy a car. But we also know here, and we don't like to admit it, that because we are human beings we all suffer from the risk of getting sick. And we also all know that we'll get seriously sick. And we also know that we can't predict when. And we also know that when we do, there will be our fellow taxpayers through the Federal Government who will pay for this. If we do not buy insurance, we will pay nothing. And that happens with a large number of people in this group of 40 million, none of whom can be picked out in advance. Now, that's quite different from a car situation, and it's different in only this respect. It shows there is a national problem, and it shows there is a national problem that involves money, cost insurance. So if Congress could do this, should there be a disease that strikes the United States and they want every one inoculated even though ten million will be hurt, it's hard for me to decide why that isn't interstate commerce, even more so where we know it affects everybody. MR. CLEMENT: Well, Justice Breyer, there are other markets that affect every one: transportation, food, burial services, though we don't like to talk about that either. There also are situations where there are many economic effects from somebody's failure to purchase a product. And if I could, if I could talk about the difference between the health insurance market and the health care market, I mean, ultimately I don't want you to leave here with the impression that anything turns on that. Because if the government decided tomorrow that they would come up with a great — some of these — some private companies come up with a great new wonder drug that would be great for everybody to take, would have huge health benefits for everybody; and by the way, also if everybody had to buy it, it would facilitate economies of scale, and the production would be great, and the price would be cheaper and force everybody in the health care market, the actual health care market to buy the wonder drug, I'd be up here making the same argument. I would be saying that's not a power that's within the commerce power of the Federal Government. It is something much greater. And it would have been much more controversial. That's why the important things. In Federalist 45, Madison says the commerce power. That's a new power, but it's not one anyone has any apprehension about. JUSTICE KAGAN: Well, once again though, who's in commerce and what are they in commerce? If the effect of all these uninsured people is to raise everybody's premiums, not just when they get sick, if they get sick, but right now in the aggregate, and Wickard and Raich tell us we should look at the aggregate, and the aggregate of all these uninsured people are increasing the normal family premium, Congress says, by a thousand dollars a year. Those people are in commerce. They are making decisions that are affecting the price that everybody pays for this service. MR. CLEMENT: Justice Kagan, again, with all due respect, I don't think that's a limiting principle. My unwillingness to buy an electric car is forcing up the price of an electric car. If only more people demanded an electric car there would be economies of scale, and the price would go down. MR. CLEMENT: Justice Kagan, first of all, I do think there — this is not the only place where there's uncompensated care. If some — if I don't buy a car and somebody goes on welfare, I'm going to end up paying for that as well. But let me also say that there is a real disconnect then between that focus on what makes this different and statute that Congresses passed. If all we were concerned about is the cost sharing that took place because of uncompensated care in emergency rooms, presumably we have before us a statute that only addressed emergency care and catastrophic insurance coverage. But it covers everything, soup to nuts, and all sorts of other things. And that gets at the idea that there is two kinds of cost shifting that are going on here. One is the concern about emergency care and that somehow somebody who gets sick is going to shift costs back to other policy areas — holders. But there is a much bigger cost shifting going on here, and that's the cost shifting that goes on when you force healthy people into an insurance market precisely because they are healthy, precisely because they are not likely to go to the emergency room, precisely because they are not likely to use the insurance they are forced to buy in the health care insurance. That creates a huge windfall. It lowers the price of premiums. JUSTICE BREYER: All that sounds like you're debating the merits of the bill. You ask really for limiting principles so we don't get into a matter that I think has nothing to do with this case: broccoli, okay? And the limiting principles, you've heard three. First, the Solicitor General came up with a couple joined, very narrow ones. You've seen in Lopez this Court say that we cannot, Congress cannot get into purely local affairs, particularly where they are noncommercial. And, of course, the greatest limiting principle of all, which not too many accept, so I'm not going to emphasize that, is the limiting principle derived from the fact that members of Congress are elected from States and that 95 percent of the law of the United States is State law. That is a principle though enforced by the legislature. The other two are principles, one written into Lopez and one you just heard. It seems to me all of those eliminate the broccoli possibility, and none of them eliminates the possibility that we are trying to take the 40 million people who do have the medical cost, who do affect interstate commerce and provide a system that you may like or not like. That's where we are in limiting principles. MR. CLEMENT: Well, Justice Breyer, let me take them in turn. I would encourage this Court not to Garcia-ize the Commerce Clause and just simply say it's up to Congress to police the Commerce Clause. So I don't think that is a limiting principle. JUSTICE SOTOMAYOR: Yes, but that's exactly what Justice Marshall said in Gibbons. He said that it is the power to regulate, the power like all others vested in Congress is complete in itself, may be exercised to its utmost extent, and acknowledges no limitations other than those prescribed in the Constitution. But there is no conscription in the, set forth in the Constitution with respect to regulating commerce. MR. CLEMENT: I agree 100 percent, and I think that was the Chief Justice's point which was once you open the door to compelling people into commerce based on the narrow rationales that exist in this industry, you are not going to be able to stop that process. JUSTICE SCALIA: I would like hear you address Justice Breyer's other, other two principles. MR. CLEMENT: Well, the other two principles are Lopez — and this case really is not — I mean, you know, Lopez is a limit on the affirmative exercise of people who are already in commerce. The question is, is there any other limit to people who aren't in commerce? And so I think this is the case that really asks that question. And then the first point which was I take it to be the Solicitor General's point is, with all due respect, simply a description of the insurance market. It's not a limiting principle, because the justification for why this is a valid regulation of commerce is in no way limited to this market. It simply says, these are economic decisions, they have effect on other people, my failure to purchase in this market has a direct effect on others who are already in the market. That's true of virtually every other market under the sun. CHIEF JUSTICE ROBERTS: And now maybe return to Justice Sotomayor's question. MR. CLEMENT: I'd be delighted to, which is — I mean, I — you are absolutely right. Once you're in the commerce power, there is not — this Court is not going to police that subject maybe to the Lopez limit. And that's exactly why I think it's very important for this Court to think seriously about taking an unprecedented step of saying that the commerce power not only includes the power to regulate, prescribe the rule by which commerce is governed, the rule of Gibbons v. Ogden. But to go further and say it's not just prescribing the rule for commerce that exists but is the power to compel people to enter into commerce in the first place. I would like to say two very brief things about the taxing power, if I could. There are lots of reasons why this isn't a tax. It wasn't denominated a tax. It's not structured as a tax. If it's any tax at all, though, it is a direct tax. Article I, Section 9, clause 4, the Framers would have had no doubt that a tax on not having something is not an excise tax but a forbidden direct tax. That's one more reason why this is not proper legislation because it violates that. JUSTICE SOTOMAYOR: Would you tell me, do you think the States could pass this mandate. JUSTICE SOTOMAYOR: Is there any other area of commerce, business, where we have held that there is a concurrent power between the State and the Federal Government to protect the welfare of commerce? MR. CLEMENT: Well, Justice Sotomayor, I have to resist your premise, because I didn't answer yes, the States can do it because it would be a valid regulation of intrastate commerce. I said yes, the States can do it because they have a police power, and that is the fundamental difference between the States on the one hand and the limited, enumerated Federal Government on the other. CHIEF JUSTICE ROBERTS: Thank you, Mr. Clement. Mr. Carvin. I'd like to begin with the Solicitor General's main premise, which is that they can compel the purchase of health insurance in order to promote commerce in the health market because it will reduce uncompensated care. If you accept that argument, you have to fundamentally alter the text of the Constitution and give Congress plenary power. It simply doesn't matter whether or not this regulation will promote health care commerce by reducing uncompensated care; all that matters is whether the activity actually being regulated by the act negatively affects Congress or negatively affects commerce regulation, so that it's within the commerce power. If you agree with us that this is — exceeds commerce power, the law doesn't somehow become redeemed because it has beneficial policy effects in the health care market. In other words, Congress does not have the power to promote commerce. Congress has — Congress has the power to regulate commerce. And if the power exceeds their permissible regulatory authority, then the law is invalid. CHIEF JUSTICE ROBERTS: Well, surely regulation includes the power to promote. Since the New Deal we've said that regulation in — there is a market agricultural products; Congress has the power to subsidize, to limit production, all sorts of things. CHIEF JUSTICE ROBERTS: I don't — I don't think you're addressing their main point, which is that they are not creating commerce in — in health care. It's already there, and we are all going to need some kind of health care; most of us will at some point. CHIEF JUSTICE ROBERTS: Yet we don't know who they are. JUSTICE GINSBURG: But the problem is — the problem is this they are making the reinvent of us pay for it, because as much as they say, well, we are not in the market, we don't know when the — the timing when they will be. JUSTICE GINSBURG: And the — the figures that how much more families are paying for insurance because people get sick, they may have intended to self-insure, they haven't been able to meet the bill for — for cancer, and the rest of us end up paying because these people are getting cost-free health care, and the only way to prevent that is to have them pay sooner rather than later, pay up front. MR. CARVIN: Yes, but my point is this. That, with respect, Justice Ginsburg, conflicts the people who do result in uncompensated care, the free riders. Those are people who default on their health care payments. That is an entirely different group of people, an entirely different activity than being uninsured. MR. CARVIN: Because — I'm sorry. MR. CARVIN: I was just going to say, because if they have that power, then they obviously have the power to regulate everything because everything in the aggregate is statistically connected to something that negatively affects commerce, and every compelled purchase promotes commerce. JUSTICE BREYER: I'm just picking on something. I'd like to just — if it turned out there was some terrible epidemic sweeping the United States, and we couldn't say that more than 40 or 50 percent — I can make the number as high as I want — but the — the — you'd say the Federal Government doesn't have the power to get people inoculated, to require them to be inoculated, because that's just statistical. JUSTICE BREYER: Is your answer to that yes or no? JUSTICE BREYER: No, they could not do it. JUSTICE BREYER: They cannot require people even if this disease is sweeping the country to be inoculated. The Federal Government has no power, and if there's — okay, fine. Go ahead. JUSTICE BREYER: Please turn to Justice Kagan. MR. CARVIN: May I just please explain why? JUSTICE BREYER: — that it had huge negative effects but the majority thought that was a local matter. JUSTICE ALITO: Mr. Carvin, isn't there this difference between Justice Breyer's hypothetical and the law that we have before us here? In his hypothetical harm to other people from the communicable disease is the result of the disease. It is not the result of something that the government has done, whereas here the reason why there is cost shifting is because the government has mandated that. It has required hospitals to provide emergency treatment, and instead of paying for that through a tax which would be born by everybody, it has required — it has set up a system in which the cost is surreptitiously shifted to people who have health insurance and who pay their bills when they go to the hospital. MR. CLEMENT: Justice Alito, that is exactly the government's argument. It's an extraordinarily illogical argument. JUSTICE BREYER: — and say that in fact it turns out that 90 percent of all automobiles driving interstate without certain equipment put up pollution, which travels interstate — not 100 percent, maybe only 60 percent. Does the EPA have the power then to say you've got to have an antipollution device? It's statistical. JUSTICE BREYER: Then you're not going on statistics; you're going on something else which is what I'd like to know what it is. MR. CARVIN: It's this. They can't require you to buy a car with an anti-pollution device. Once you've entered the market and made a decision they can regulate the terms and conditions of the car that you do, and they can do it for all sorts of reasons. What they can't do it compel you to enter the market. JUSTICE BREYER: Now we — now you've changed the ground of argument, which I accept as — as totally legitimate. And then the question is when you are born, and you don't have insurance, and you will in fact get sick, and you will in fact impose costs, have you perhaps involuntarily — perhaps simply because you are a human being — entered this particular market, which is a market for health care? MR. CARVIN: If being born is entering the market, then I can't think of a more plenary power Congress can have, because that literally means they can regulate every human activity from cradle to grave. thought that's what distinguished the plenary police power from the very limited commerce power. JUSTICE BREYER: I see the point. You can go back to, go back to Justice Kagan. Don't forget her question. JUSTICE KAGAN: I've forgotten my question. MR. CARVIN: I — I was facing the same dilemma, Justice Kagan. JUSTICE KAGAN: See what it means to be the junior justice? JUSTICE GINSBURG: It just seems very strange to me that there's no question we can have a Social Security system besides all the people who say: I'm being forced to pay for something I don't want. And this it seems to me, to try to get care for the ones who need it by having everyone in the pool, but is also trying to preserve a role for the private sector, for the private insurers. There's something very odd about that, that the government can take over the whole thing and we all say, oh, yes, that's fine, but if the government wants to get — to preserve private insurers, it can't do that. MR. CARVIN: Well I don't think the test of a law's constitutionality is whether it more adheres to the libertarian principles of the Cato Institute or the statist principles of someone else. I think the test of a law's constitutionality is not those policy questions; it's whether or not the law is regulating things that negatively affect commerce or don't. JUSTICE GINSBURG: I thought — I thought that Wickard was you must buy; we are not going to let you use the home-grown wheat. You have got to go out in the market and buy that wheat that you don't want. MR. CARVIN: Oh, but let's be careful about what they were regulating in Wickard, Justice Ginsburg. What they were regulating was the supply of wheat. It didn't in any way imply that they could require every American to go out and buy wheat. And yes, one of the consequences of regulating local market participants is it'll affect the supply and the demand for the product. That's why you can regulate them, because those local market participants have the same effect on the interstate market that a black market has on a legal market. But none of that is true — in other words, you can regulate local bootleggers, but that doesn't suggest you can regulate teetotalers, people who stay out of the liquor market, because they don't have any negative effect on the existing market participants or on regulation of those market participants. JUSTICE KAGAN: That's why I suggested, Mr. Carvin, that it might be different if you were raising an as-applied challenge and presenting a class of people whom you could say clearly would not be in the health care market. But you're raising a facial challenge and we can't really know which, which of the many, many, people that this law addresses in fact will not participate in the health care market and in fact will not impose costs on all the rest of us. So the question is can Congress respond to those facts, that we have no crystal ball, that we can't tell who is and isn't going to be in the health insurance market, and say most of these people will be and most of these people will thereby impose costs on the rest of us and that's a problem that we can deal with on a class-wide basis? MR. CARVIN: No again. The people who impose the costs on the rest of us are people who engage in a different activity at a different time, which is defaulting on their health care payments. It's not the uninsured. Under your theory you could regulate anybody if they have got a statistical connection to a problem. You could say, since we could regulate people who enter into the mortgage market and impose mortgage insurance on them, we can simply impose the requirement to buy private mortgage insurance on everybody before they have entered the market because we are doing it in this prophylactic way before it develops. CHIEF JUSTICE ROBERTS: No, no, that's not — I don't think that's fair, because not everybody is going to enter the mortgage market. The government's position is that almost everybody is going to enter the health care market. MR. CARVIN: Two points, one of which Mr. Clement's already made, which is the health insurance market is different than the health care market. But let me take it on full-stride. I think everybody is in the milk market. I think everybody is in the wheat product market. But that doesn't suggest that the government compel you to buy five gallons of meat or five bushels of wheat because they are not regulating commerce. JUSTICE SOTOMAYOR: I mean, but that's true of almost every product. JUSTICE SOTOMAYOR: It's true of almost every product, directly or indirectly by government regulation. The government says, borrowing my colleague's example, you can't buy a car without emission control. I don't want a car with emission control. It's less efficient in terms of the horsepower. But I'm forced to do something I don't want to do by government regulation. MR. CARVIN: Let's think about it this way. Yes, when you've entered the marketplace they can impose all sorts of restrictions on you, and they can impose, for example, all kinds of restrictions on States after they have enacted laws. They can wipe out the laws. They can condition them. But what can't they do? They can't compel States to enact laws. They can't compel States to carry out Federal law. And I am arguing for precisely the same distinction, because everyone intuitively understands that regulating participants after A and B have entered into a contract is fundamentally less intrusive than requiring the contract. JUSTICE SOTOMAYOR: We let the government regulate the manufacturing process whether or not the goods will enter into interstate commerce, merely because they might statistically. We — there is all sorts of government regulation of manufacturing plants, of agricultural farms, of all sorts of activity that will be purely intrastate because it might affect interstate activity. JUSTICE SOTOMAYOR: So how is that different from saying you are self-insuring today, you're foregoing insurance? Why isn't that a predecessor to the need that you're eventually going to have? JUSTICE BREYER: What about — the simplest counter-example for me to suggest is you've undoubtedly read Judge Sutton's concurring opinion. He has about two pages, it seemed to me, of examples where everyone accepts the facts that under these kinds of regulations the government can compel people to buy things they don't otherwise want to buy. For example, he gives, even in that farm case, the farmer who was being forced to go out and buy grain to feed to his animals because he couldn't raise it at home. You know and he goes through one example after another. So what — what is your response to that, which you've read? MR. CARVIN: Judge Sutton is wrong in each and every example. There was no — there was no compulsion in Raich for him to buy wheat. He could have gotten wheat substitutes or he could have not sold wheat, which is actually what he was doing. There is a huge difference between conditioning regulation, i.e., conditioning access to the health care market and saying you must buy a product, and forcing you to buy a product. And that, that — I'm sorry. JUSTICE GINSBURG: I thought it was common ground that the requirement that the insurers — what was it, the community-based one and they have to insure you despite your health status; they can't refuse because of preexisting conditions. The government tells us and the Congress determined that those two won't work unless you have a pool that will include the people who are now healthy. But so — well, first, do you agree with your colleague that the community-based — and what's the name that they give to the other? JUSTICE GINSBURG: Yes. That that is legitimate Commerce Clause legislation? MR. CARVIN: Oh, sure. And that's why -­but we don't in any way impede that sort of regulation. These nondiscrimination regulations will apply to every insurance company just as Congress intended whether or not we buy insurance. JUSTICE GINSBURG: Well then, what about the determination that they can't possibly work if people don't have to buy insurance until they are — their health status is such that the insurance company just dealt with them on its — as it will? I won't insure you because you're — you're already sick. JUSTICE SOTOMAYOR: They had an allergic reaction and a simple shot would have saved the child? JUSTICE SOTOMAYOR: I'm sorry, did you say the penalty's okay but not the mandate? I'm sorry. Maybe I've misheard you. MR. CARVIN: No. No. I was — they create this strawman that says look, the only alternative to doing it the way we've done it, if we condition access to health care on buying health insurance, the only way you can enforce that is making sick people not get care. I'm saying no, no. There's a perfectly legitimate way they could enforce their alternative; i.e. requiring you to buy health insurance when you access health care, which is the same penalty structure that's in the Act. There is no moral dilemma between having people have insurance and denying them emergency service. Congress has made a perfectly legitimate value judgment that they want to make sure that people get emergency care. Since the founding, whenever Congress has imposed that public responsibility on private actors, it has subsidized it from the Federal Treasury. It has not conscripted a subset of the citizenry and made them subsidize the actors who are being hurt, which is what they're doing here. They're making young healthy people subsidize insurance premiums for the cost that the nondiscrimination provisions have put on insurance premiums and insurance companies. MR. CARVIN: — and that — that is the fundamental problem here. JUSTICE SOTOMAYOR: So the — I — I want to understand the choices you're saying Congress has. Congress can tax everybody and set up a public health care system. JUSTICE SOTOMAYOR: That would be okay. MR. CARVIN: I would accept that. JUSTICE SOTOMAYOR: Congress can — you're taking the same position as your colleague, Congress can't say we're going to set up a public health system, but you can get a tax credit if you have private health insurance because you won't access the public system. Are you taking the same position as your colleague? JUSTICE SOTOMAYOR: So how is this different than this Act which says if a taxpayer fails to meet the requirement of having minimum coverage, then they are responsible for paying the shared responsibility payment? JUSTICE SOTOMAYOR: I think — I think that's what's happening, isn't it? JUSTICE SOTOMAYOR: We're paying — I thought that everybody was paying, what is it, $10 a pack now? I don't even know the price. It's pretty high. JUSTICE SOTOMAYOR: I think everybody recognizes that it's all taxation for the purposes of dissuading you to buy it. MR. CARVIN: That's precisely my point. And everyone intuitively understands that that system is dramatically different than saying cigarettes tomorrow are illegal. It is different. JUSTICE BREYER: It is different. It is different. I agree with that. But you pointed out, and I agree with you on this, that the government set up these emergency room laws. The government set up Medicaid. The government set up Medicare. The government set up CHIP, and there are 40 million people who don't have the private insurance. In that world, the government has set up commerce. It's all over the United States. And in that world, of course, the decision by the 40 million not to buy the insurance affects that commerce, and substantially so. So I thought the issue here is not whether it's a violation of some basic right or something to make people buy things they don't want, but simply whether those decisions of that group of 40 million people substantially affect the interstate commerce that has been set up in part through these other programs. So that's the part of your argument I'm not hearing. MR. CARVIN: It is clear that the failure to buy health insurance doesn't affect anyone. Defaulting on your payments to your health care provider does. Congress chose for whatever reason not to regulate the harmful activity of defaulting on your health care provider. They used the 20 percent or whoever among the uninsured as a leverage to regulate the 100 percent of the uninsured. JUSTICE KENNEDY: I agree — I agree that that's what's happening here. JUSTICE KENNEDY: And the government tells us that's because the insurance market is unique. And in the next case, it'll say the next market is unique. But I think it is true that if most questions in life are matters of degree, in the insurance and health care world, both markets — stipulate two markets — the young person who is uninsured is uniquely proximately very close to affecting the rates of insurance and the costs of providing medical care in a way that is not true in other industries. That's my concern in the case. MR. CARVIN: And, Your — I may be misunderstanding you, Justice Kennedy. I hope I'm not. Sure. It would be perfectly fine if they allowed — you do actuarial risk for young people on the basis of their risk for disease, just like you judge flood insurance on the homeowner's risk of flood. One of the issues here is not only that they're compelling us to enter into the marketplace, they're not — they're prohibiting us from buying the only economically sensible product that we would want. Catastrophic insurance. Everyone agrees the only potential problem that a 30-year-old, as he goes from the healthy 70 percent of the population to the unhealthy 5 percent. And yet Congress prohibits anyone over 30 from buying any kind of catastrophic health insurance. And the reason they do that is because they needed this massive subsidy. Justice Alito, it's not our numbers. CBO said that injecting my clients into the risk pool lowers premiums by 15 to 20 percent. So, Justice Kennedy, even if we were going to create exceptions for people that are outside of commerce and inside of commerce, surely we'd make Congress do a closer nexus and say look, we're really addressing this problem. We want these 30-year-olds to get catastrophic health insurance. And not only did they — they deprived them of that option. And I think that illustrates the dangers of giving Congress these plenary powers, because they can always leverage them. They can always come up with some public policy rationale that converts the power to regulate commerce into the power to promote commerce, which, as I was saying before, is the one that I think is plenary. JUSTICE KAGAN: Mr. Carvin, a large part of this argument has concerned the question of whether certain kinds of people are active participants in a market or not active participants in a market. In your test, which is a test that focuses on this activity/inactivity distinction, would force one to confront that problem all the time. Now, if you look over the history of the Commerce Clause, what you see is that there were sort of unhappy periods when the Court used tests like this -­direct versus indirect, commerce versus manufacturing. I think most people would say that those things didn't really work. And the question is, why should this test, inactive versus active, work any better? MR. CARVIN: The problem you identify is exactly the problem you would create if you bought the government's bogus limiting principles. You'd have to draw distinctions between the insurance industry and the car industry and all of that. We turn you to the Commerce Clause jurisprudence that bedeviled the Court before the 1930s, where they were drawing all these kinds of distinctions among industries; whereas our test is really very simple. Are you buying the product or is Congress compelling you to buy the product? I can't think of a brighter line. And again, if Congress has the power to compel you to buy this product, then obviously, they have got the power to provide you — to compel you to buy any product, because any purchase is going to benefit commerce, and this Court is never going to second-guess Congress's policy judgments on how important it is this product versus that product. JUSTICE ALITO: Do you think they are drawing a line between commerce and everything else that is not commerce is drawing an artificial line, drawing a line between Congress and manufacturing? MR. CARVIN: The words "inactivity" and "activity" are not in the Constitution. The words "commerce" and "noncommerce" are. And again, it's a distinction that comes, Justice Kagan, directly from the text of the Constitution. The Framers consciously gave Congress the ability to regulate commerce, because that's not a particularly threatening activity that deprives you of individual freedom. If you were required, if you were authorized to require A to transfer property to B, you have, as the early cases put it, a monster in legislation which is against all reason in justice, because everyone intuitively understands that regulating people who voluntarily enter into contracts in setting changing conditions does not create the possibility of Congress compelling wealth transfers among the citizenry. And that is precisely why the Framers denied them the power to compel commerce, and precisely why they didn't give them plenary power. CHIEF JUSTICE ROBERTS: Thank you, Mr. Carvin. General Verrilli, you have four minutes remaining. REBUTTAL ARGUMENT OF DONALD B. VERRILLI, JR., ON BEHALF OF THE PETITIONERS GENERAL VERRILLI: Thank you, Mr. Chief Justice. Congress confronted a grave problem when it enacted the Affordable Care Act. The 40 million Americans who can't get health insurance and suffered often very terrible consequences. Now, we agree, I think — everyone arguing this case agrees that Congress could remedy that problem by imposing the insurance requirement at the point of sale. That won't work. The reason it won't work is because people will still show up at the hospital or at their physician's office seeking care without insurance, causing the cost shifting problem. And Mr. Clement's suggestion that they can be signed up for a high risk pool at that point is utterly unrealistic. Think about how much it would cost to get the insurance when you are at the hospital or at the doctor. It would be — it would be unfathomably high, that will never work. Congress understood that. It chose a means that will work. The means that it saw work in the States and in the State of Massachusetts and that, and that it had every reason to think would work on a national basis. That is the kind of choice of means that McCulloch says that the Constitution leaves to the democratically accountable branches of government. There is no temporal limitation in the Commerce Clause. Everyone subject to this regulation is in or will be in the health care market. They are just being regulated in advance. That's exactly the kind of thing that ought to be left to the judgment of Congress and the democratically accountable branches of government. And I think this is actually a paradigm example of the kind of situation that Chief Justice Marshall envisioned in McCulloch itself, that the provisions of the Constitution needed to be interpreted in a manner that would allow them to be effective in addressing the great crises of human affairs that the Framers could not even envision. But if there is any doubt about that under the Commerce Clause, then I urge this Court to uphold the minimum coverage provision as an exercise of the taxing power. Under New York v. United States, this is precisely a parallel situation. If the Court thinks there is any doubt about the ability of Congress to impose the requirement in 5000A(a), it can be treated as simply the predicate to which the tax incentive of 5000A(b) seeks accomplishment. And the Court — as the Court said in New York, has a solemn obligation to respect the judgments of the democratically accountable branches of government, and because this statute can be construed in a manner that allows it to be upheld in that way, I respectfully submit that it is this Court's duty to do so. Counsel, we'll see you tomorrow.